Cristiano Ronaldo: "My birthday wish is to win the Champions League"
05.02.2011 » Cristiano Ronaldo: "My birthday wish is to win the Champions League"
Cristiano Ronaldo revealed today, his biggest wish for his birthday. The portuguese player said that winning the UEFA Champions League for Real Madrid would be the best thing he could wish for himself. Cristiano Ronaldo birthday is today and greetings have been arriving from all around the world. The portuguese player talked to the spanish press and revealed his birthday wish: "The 10th UEFA Champions League for Real Madrid would be my best birthday gift possible. Everyone in the team is working really hard towards that goal." Cristiano Ronaldo also praised José Mourinho: "He's the right person to lead Real Madrid to success. Everyone is confident that Real Madrid will win something this year. Personally, I love to work with such an ambitious coach as he is." José Mourinho talked once more about Cristiano Ronaldo lack of goals lately and used his irony to point out some facts. "He has dramatic numbers indeed. He played all the matches this season, except for the game against Levante. Even if he wouldn't score any more goal, this would still be a tremendous season and we're still in February." On this special day, José Mourinho answered Walter Pandiani critics from earlier this week, where the Uruguayan insulted Ronaldo by saying: "Cristiano Ronaldo has a screw loose" and that "he's always being defended by his Daddy". The portuguese coach fired back a couple of days ago, saying that Pandiani is only looking to get free publicity, and that the Uruguayan player knew he would get that if he just started insulting Cristiano Ronaldo. However, Mourinho realised the lack of education from Pandiani's side, when the Uruguayan refered to him as Ronaldo's "daddy", since the portuguese player's father actually died 5 years ago. Therefore, Mourinho just said today: "His daddy will always defend him. ", in an attempt to close this topic. 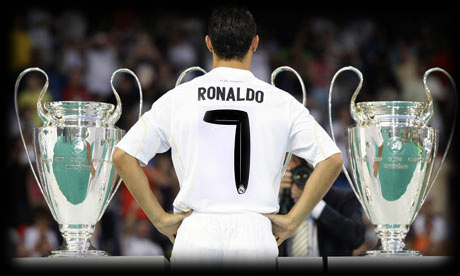 Real Madrid will receive Real Zaragoza tomorrow, and you can watch this game here on ronaldo7.net.